UK policy and guidance state that people should have their preferences and priorities for end of life care recorded in the form of an advance care plan. UK policy and guidance state that people should have their preferences and priorities for end of life care recorded in the form of an advance care plan. However, for people with dementia and their families, issues of reduced capacity, difficulties with discussing end of life preferences and staff understanding can present challenges. This research focus summarises two studies that explore these issues. This study explores the effectiveness of an education programme, Let Me Decide, designed to support the development of advance care planning (ACP) for people with cognitive impairment and frailty. The programme was implemented with 30 senior nurses from two nursing homes and one community hospital in Ireland, totalling 290 beds. Surveys were carried out with staff to assess knowledge of ACP and palliative care, learning needs and perceived barriers to implementation. Workshops on palliative care, communication skills, bereavement, symptom assessment and management were subsequently delivered to nurses and healthcare assistants in the respective settings. 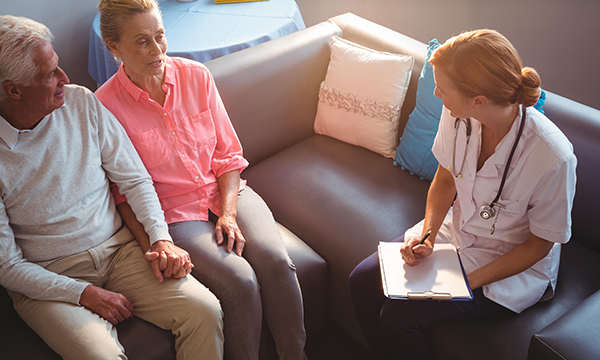 Senior nurses were provided with documentation to implement ACP in their settings, including an assessment of cognition and residents’ capacity to complete an advance directive, education of willing residents/families about ACP and an end of life care (EoLC) plan for those with limited capacity. After the programme more than 50% of residents across all settings had an EoLC plan in place. Of residents who died 86% had a plan – 76% of which were completed by the medical team with the resident, where able, and family. Barriers to ACP included the diminishing capacity of most residents, hearing and communication impairments, lack of understanding of ACP by residents and families and inadequate time to support families in decision making. Adaptations such as visual aids were made to enhance understanding for families and residents and improve engagement. Staff reported the programme improved their ability to engage in difficult conversations with residents and families about death and dying. The article concludes that the programme enabled a systematic approach to implementation of ACP and improved communication and increased autonomy for residents. A number of recommendations are made for implementing a programme to support ACP for people with limited capacity. They include supporting discussions with the person and their family together about EoLC preferences, exploring values and beliefs, best interest decisions and gaining assent wherever possible from the person. McGlade C, Daly E, McCarthy J et al (2017) Nursing Ethics. 24, 1, 87-99. This study explores the experiences and views of people with dementia and family carers about healthcare decision making in the past, present and future. It draws on findings from a previous study published by the authors in 2016, which found that family carers may have a different understanding about the person with dementia’s end of life wishes to that of the person. The study uses a qualitative approach with a sample of six couples, including one additional adult child, taken from the original study. Using brief semi-structured interviews, participants were asked about previous approaches to healthcare decision making and how a diagnosis of dementia influences present and future decisions. Findings indicated that although joint decision-making was previously common among the couples, this had not usually involved decisions about healthcare. A diagnosis of dementia was seen to change decision making, especially for carers who took on increased responsibility. However, the ability to make long-term plans and decisions was limited due to the challenges of getting through each day, leaving families with little energy to address future wishes. The original study noted that people with dementia may have difficulty in conceiving their future self. Participants expressed uncertainty about making future decisions and felt they needed more information and support to make decisions about EoLC. The study concludes that families need ongoing support and guidance in making decisions about future healthcare preferences that acknowledge changes as dementia progresses. It also highlights that carers and people with dementia may have differing views about EoLC and this needs to be considered carefully. To implement ACP, it recommends that clinicians explore families’ previous approaches to decision making, which balance the person with dementia’s wishes and acknowledge carers’ need for support in decision making. Dening KH, King M, Jones L et al (2017) International Journal of Palliative Nursing. 23, 1, 4-11.